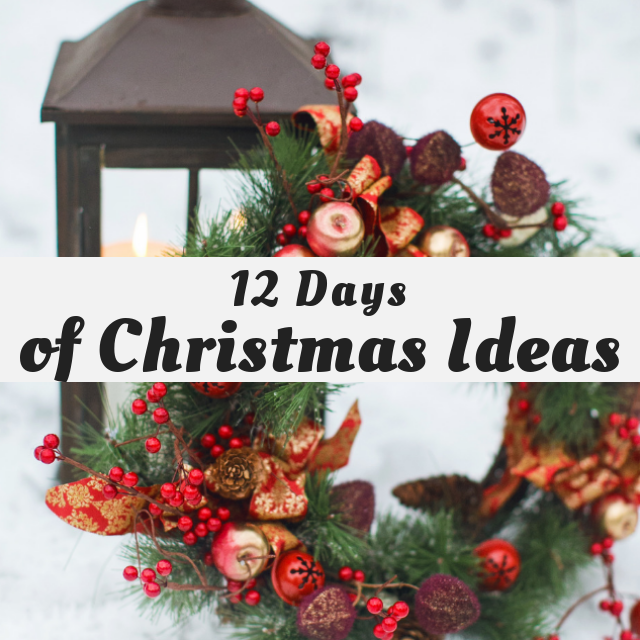 This DIY Christmas Centerpiece is created to be practical. Most of the year I don’t miss not having a separate dining room, but at Christmas I certainly do. On top of that, I get really frazzled when trying to do anything on cluttered countertops. Its even worse in a small kitchen with guests and entertaining. This practical DIY Christmas Centerpiece is my solution and it works really well. I recommend trying it. This centerpiece is based on the most basic items you will need for a table setting. To make one you need a large tray, a large tiered tray is the best. Other than the tray you gather whatever table setting items you have. Start by gathering cutlery, plates, napkins, salt and pepper shakers, cream a sugar set, even cups and glasses if you have room. Go through your items and pick the ones that match the best. For example, I have red plates, so I used white napkins. These plates are a couple of years old from Home Sense. Shop your Christmas box for any greenery, small ornaments, pine cones, beads, mini lights, garland etc. that would match your colour theme. Other than the tray, grab what other accessories you think may match. I used a small milk glass dish, Christmas salt and pepper shakers, a small galvanized tray. As well as an antique flour sifter and a heating pad that matches my farmhouse curtains. Put the items you need for a table setting into their containers and then place in the tray. Once placed in the tray, add any additional decor you have, like this greenery, star lights and cinnamon scented pinecones. Do the same with the other tier or tiers of your tray. The top tier cutler is organized using an antique flour sifter, but any enamelware, a mason jar, or small vase would work as well. The little candy salt and pepper shakers are the one new thing in this arrangement. I fell in love with this cute candy shaped shakers, so fun. The back of the tray has a small wreath and the front is filled with red beads to hide the battery pack for the mini lights. The tray is just enough decor to say our table has a centerpiece, and because it holds everyday items it saves me time as Hubs and I can just grab our place setting for snacks, so handy, especially when it’s just the two of us. My favorite part is that the tray not only provides a colourful centerpiece, it gives me a little more room in the cupboard. Like it! Please Pin it for Later! I really love how it turned out! I love tiered tray arrangements, and I pinned this for next year! What a pretty centerpiece! I love that tiered tray! Tiered trays are so handy. They are great for organizing and saving space. Thank you Susan. I love the tiered tray idea with the ribbon! It could be changed out for different seasons. Think I’m going to get one and make a hot cocoa area with itfor Christmas. Thanks for the idea! That”s a great idea. Tiered trays are so handy and give you extra counter space no matter where you use them. Glad you like this one. You know how I feel about buffalo check so I’m loving this! You put it together beautifully! Thank you Michelle, I know you love it as well. I love what you doing with your home as well. Thank you Deborah. It’s a simple idea, but so handy and helps me work around the no dining room issue. Thank you Deborah, its a very handy workaround for getting a centerpiece when space is limited. Love this idea, Leanna! Perfect so you don’t have to keep running back to the kitchen for goodies and looks gorgeous at the same time! Would be awesome too if you decided to eat outside! Then all you would have to do is pick up your tray and move outside. I love to have beautiful centerpieces, but they use up more room than I have available. Your right, I should move it outside this summer. Your little home sounds so picturesque, and I know its artsy and so well designed. Your practical centerpiece is a great idea and it looks lovely. I love the milk glass piece. I have the same or very similar one. What a great centerpiece! It’s both functional and pretty 🙂 Wrapping the outside of the trays with the buffalo check ribbon is a great idea. Yes to the buffalo check and galvanized tiered trays – you can’t get much more rustic than that 🙂 Love this simplicity of this! I think this is a great idea to use for entertaining during the holidays in a big or small room. I love how you wrapped the galvanized metal with your signature black & white buffalo check. Very festive and inviting, Leanna! Thank you Marie. Our home is starting to come together the way I want it. I am glad because this old hen is starting to think about coffee and nibblies and nothing else lol. I like how you carried out the buffalo check theme on the centerpiece. Not only is it practical but charming as well. Thank you Debra. Every year I have to come up with some sort of centerpiece that I can move or make dual purpose. I would love to just have a beautiful centerpiece with fresh flowers. Maybe once we retire and move. Thank you for commenting, I really appreciate your positive input. Gorgeous tray! I love the black and white buffalo check, the lights, and the milk glass dish. Pretty! What a great idea! I love when decorations are not only beautiful but still functional. Your tiered tray is so cute too! I love your tiered tray and the way you’ve styled it! Beautiful! Your tiered tray is so pretty & functional, I love the little touches and the black and white buffalo check! I do not own a tiered tray, now you make me feel like getting one. It’s gorgeous Leanna!